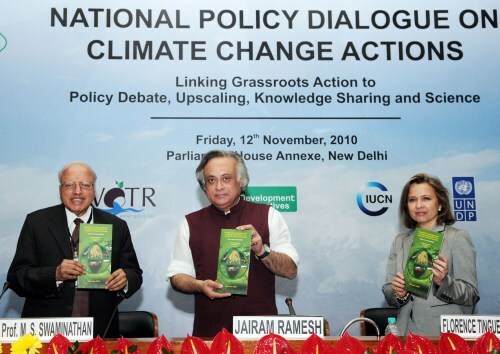 Speaking at the National Policy Dialogue on Climate Change Action in New Delhi, Environment Minister Jairam Ramesh brought out a very important concern: that adaptation to climate change is not only a government obligation but should be looked upon as a community responsibility. Mr. Ramesh said, “It is unfortunate that our approach on climate change has been unduly influenced by international negotiations. We need to delink from international community and focus on domestic agenda to fight climate change”. Expressing his views on making adaptation to climate change a community driven process Mr. Ramesh said, “The ministry has initiated an exercise where women self-help groups in Kerala and Andhra Pradesh are providing feasible ideas on adaptation to climate change”. Looking up to the Civil society organizations, he said that a co-ordination between the two i.e. the government and the civil society organisations, would surely yield solutions that will make this effort workable and achievable. And all the four reasons listed above need attention by us the “Indian Community” to fight the issue of climate change. Adding to this, he said “No country in the world has all the four dimensions of vulnerabilities operating together but in India this is the most important reason why we should be more worried about climate change”. After taking the lead among developing countries, in releasing updated green house gases (GHG) emissions earlier this year, the MoEF is likely to release the previously announced assessment report on the impact of climate change on agriculture, health, water and forest in the four regions of the country. These are: the Himalayas, the Western Ghats, Coastal Zone and the North East. Jincy Joy is Climate Correspondent with the Delhi Greens Blog and is passionate about communicating the impacts of climate change to the masses. She is presently pursuing a Master's degree course in Climate Science & Policy.